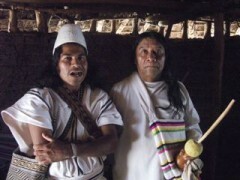 The Elder Brothers in the high Sierras of Colombia were in possession of an ETV that was buried in secret by the leader of the Tayrona peoples, Ramon Gil, in 2009. Gil is both Kogi and Wiwa, as well as a Mama. The message of the Elder Brothers became a call to action and in 2002, one of our vases was taken to Colombia by peace activist and member of Open Way Sangha, Shannyn Sollitt, where it was delivered to the Tayrona Mamas (spiritual leaders) by Asdrubal Torres, a young traditional Arhuaco who is serving his people as a bridge to the “Younger Brothers” who are causing such destruction in the world. We have told them we are listening. Shannyn Sollitt, who has forged a deep bond with these people, visited there in December 2009 and learned the vase had been buried by Ramon Gil. He accomplished the burial secretly so that it will never be disturbed. Because of our dedication to creating peace through culture initiatives, Dominique Mazeaud and myself were invited to Colombia in 2001 by Centro Colombo-Americano, a Colombian organization that fosters creative exchange in the Americas.We created performance rituals for peace in four cities, Medellin, Cali, Bucharamanga and Bogotá. In Medellin we had the opportunity to work with Asdrubal and Angel from the Arhuaco culture of Tayrona. These creative collaborations flourished into many years of interaction and support for the Tayrona peoples. 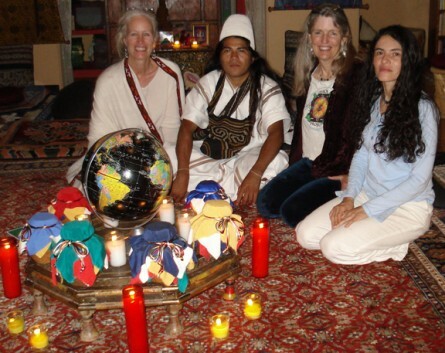 On our second visit in 2002, we brought the Earth Treasure Vase and dedicated the vase to the healing and protection of the Kogi, the indigenous world of Tayrona, and the whole of Colombia. We filled the vase in ceremonies in prestigious art institutions and universities. The offerings to the vases from the people were profound. As Colombia has been under a siege of revolution for more than 5 decades, the offerings reflected deep sadness and hope for a transformation of the terrible sufferings of war and poverty. The vase was sealed in Bogotá in the company of children from an organization, Punte en Mi Lugar (Put Yourself in My Place). This group rescues the homeless and uncared for children from the streets of Bogotá. These twenty or so children were living in a donated house where they were fed, able to bathe, and given clean clothes and shoes. Most importantly, the children attended school. They all had dreams of finding a better life away from the poverty, prostitution and drug dealing they had previously known. They had made a fabulous public mural in downtown Bogotá depicting the mythical and magic beings who lived in all the different diverse bioregions of Colombia. The vase closing ceremony was held outside on a patio. High above us on a small mountain one could see a statue of the Virgin. As the moon rose, her white form was illuminated against a dark forest. The distant view invoked for me the essence of White Tara presiding over the ceremony. The children circled up and played instruments — drums, flutes, tambourines and the like — and sang songs for the transformation of their world. Someone blew a didgeridoo into the vase as an offering. I wasn’t the only one who witnessed a white mist rising from the vase as we transformed the offerings into precious jewels for the deities of healing and protection. The next day, our final day there, we were lucky to meet some set designers who offered to build the copper box to encase the vase for burial. We left the vase in their care and later Asdrubal carefully transported the bundle back to Medellin. Then he took it up to the Tayrona leader Ramon Gil for burial. But after 6 years of very sporadic communication with Ramon, the vase was still not buried. It was confusing for him to receive this offering, especially coming from people of the United States, but he kept it in a safe place at his dwelling in the mountains outside of Santa Marta. In 2008, after I participated on the Journey for Peace and Dignity, a run that joins the Indigenous worlds of the Americas, I returned to Colombia to meet with Ramon to either retrieve the vase or make plans to bury it. I was honored to be invited there by Asdrubal and after our meeting with Ramon, I spent time in Arhuaco territory with his family. The Sierra Nevada de Santa Marta, the first mountain of the Andes, is the home to the Tayrona peoples who have lived there for millennia. Tayrona culture had four distinct language groups, the Kogi, the Arhuaco, the Wiwa, and the Kanguamo, each holding the guardianship of the directions. They have steadfastly maintained their responsibility to maintain equilibrium at the Heart of the World. Because colonization is still very prevalent in Colombia, the traditional territories of these peoples have been severely encroached upon — to the extent that one of the language groups, the Kanguamo, has disappeared. The Kogi territory is now the highest in the Sierras. 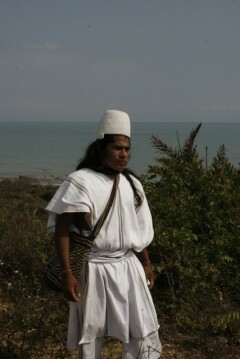 They are protected by the Arhuaco and Wiwa who live lower on the mountains. We met Ramon, not at his home, but at a refugee center he was building on the south side of the mountain in San Juan de Cesar. The Wiwa, who only number about 1700, are being driven off their land and relocated to towns. Because they cannot continue to live in their traditional mode, Ramon has built an example of the housing and their way of life inside the walls of the refugee center in the town. We drove up the mountain in a rickety jeep on an impossible road where Ramon was also building a model village of what remains of the Wiwa territory there. I experienced a wonderful sense of “Eureka!” entering the foothills…I was fulfilling my dream to experience the Heart of the World. I showed Ramon a book that Cynthia had sent with me explaining the scope of the entire Earth Treasure Vase project. Before making his decision on the fate of the vase, Ramon made a divination. He asked me to breathe on a corn husk that I had torn into seven strips according to his instructions. He said I should think of each strip as $70. 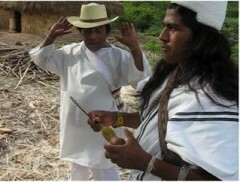 This is a method of payment to the aluna for the divination. The aluna is where all things begin, the world behind the world. He kept this payment overnight while I slept in a small hut with the women and children. According to Asdrubal, Ramon paced and chewed the coca leaf in the men’s hut for the entire night while attending to the divination that brought him on a tour through the woman’s hut in the middle of the night. In the morning he told me he would bury the vase. He also asked me to return to Tayrona to make books of photos of the Wiwa culture with translations in the languages of Tayrona, as well as Spanish and English. He also requested that I make recordings of his stories and teach English to his sons. At that moment I knew my life would completely change. I hadn’t told him I was a communications artist, but the divination must have revealed to him that this was within the purview of my skills. Cynthia had initially wanted to bring a delegation to bury this vase, but he said this would not be possible — too dangerous. The mountains are teeming with military and with colonizers who have metal detectors looking for buried metals. Because Coca is sacred and used continually by the men, the drug war is an excuse to drive the people off their traditional lands, especially if valuable metals or minerals are found underground. He felt he needed to secretly bury the vase to protect it from detection. Valledupar is a bustling town below the foothills of Arhuaco territory where the Indigenous House has the offices for the Arhuaco government. Asdrubal’s father is the Governor of the Arhuaco. 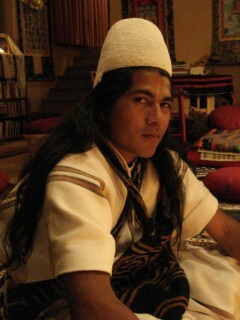 I was honored to go with him to his dwelling in the mountains. Asdrubal had recently been married to Ester and they had a new baby girl, Melony. Their marriage hut is adjacent to his parent’s homestead. I was honored to receive two cleansings from a Mama there. Sitting on the side of a hill above a rushing river, I made my payments to the aluna. Without asking, the Mama gave permission for me to bring my Goddess to this place. Before leaving Asdrubal’s home, I put on my mala and hung prayer flags of White Tara. I sat facing the morning sun beneath the fluttering flags while I practiced the traditional meditation for the filling and burial of the Earth Treasure Vases. This particular meditation experience was truly among the most memorable in my life. A tactile energy of love, healing and protection flowed into the mountains. Golden white rainbow light blasted out of the Heart of the World like an erupting volcano, encircling the whole planet. As I write this, I am making preparations to go back. This time I am bringing with me the tools to help the people create their own media communications. I am honored to serve as a bridge between these peoples and the rest of the world and enormously grateful to this Earth Treasure Vase practice for creating the opening to serve these beautiful people and the future generations of Earth in this way. You may also contact me at networks@networkearth.org. This entry was posted on Thursday, June 6th, 2013 at 12:14 pm	and is filed under Burials. You can follow any responses to this entry through the RSS 2.0 feed. You can leave a response, or trackback from your own site. My name is Camilo, I´m a Colombian historian and journalist radicated in Bogotá. I´ll be honored if there is any way to attend the ceremony in may, to participate, and if possible, to create a photographic and video record to share with the world. Is there anyone I can contact to participate? I really hope that theres an oportunity to interact in this spiritual network from my country and join a prayer for peace so needed in Colombia and our world. Just desired to say that you’ve some awesome content on your blog. Again, our thanks and best wishes to you and your homeland, Camilo.